Lighting Diagrams have always been a struggle for me. I wouldn't consider myself much of an artist, so they were always either crude napkin sketches or crude photoshop sketches. A few months my friend Evan Oliver sent me over some images he had been working on and asked me what I thought of them, and my immediate response was OMG WHERE DO I GET THOSE. He had created a library of pretty much scale accurate film tools like M18s, Skypanels, Fisher Dollies and More - and you just drag and drop them into Illustrator, Photoshop, or any other program that accepts .PNGs. He has since released them to the world as Film Set Objects, and the minute the site went live I bought myself a set. 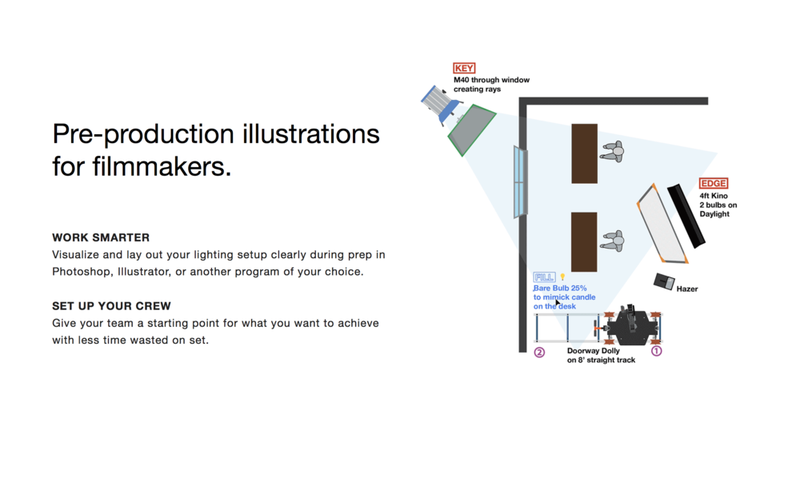 They make creating lighting sketches for myself and my crew super easy, and they make teaching even easier. Ok so let's cut to the chase - it's a $49 download, which in my opinion is CHEAP considering just how many hours of work they regularly save me. If you download FSO now you get immediate access to over 250 items - Quasars, Walls, Dollies, M18s, Hazers - you name it. They are also continually adding new objects to the library as well, and with your purchase you get access to all future updates. One thing that we're looking to do on this blog in the future is share community lighting breakdowns (I'm looking at you Brent Christy), so if you have any setups you're willing to share please email us - we're definitely interested in sharing them with the world! To help get you guys started with FSO we're giving away three copies to lucky readers - no purchase necessary - you can enter super quickly and easily using the form below. Definitely share the giveaway with a friend, and let us know how you'd use FSO in the comments below!